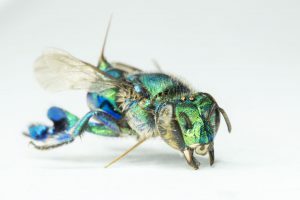 The green orchid bee, Euglossa dilemma Friese, is a large, beautiful, metallic green bee named for its unique association with orchids and its distinctive color. While it can be found in the southern half of Florida, it is not native to this state or to anywhere in the United States. Its native range includes much of Central America, and in 2003, it was first discovered in Broward County, Florida. Though we do not know for certain how it arrived in Florida, it was possibly introduced through a nest within a wooden structure such as a pallet. It may be confused with some sweat bees, which are also metallic green, though it can differentiated by its long tongue, pollen basket on the hind legs, and generally wider or more robust body size. Orchid bees, including the green orchid bee, have an interesting relationship with orchid plants. The orchid plant produces a fragrance to attract male bees. The male bees visit the plant to acquire these fragrance chemicals, which are then used to attract female bees for mating. In visiting the orchid flower, the male bee will pick up a packet of pollen called a pollinia, which is then transported to the next flower it visits, thus acting as a pollinator. This relationship is unique in that bee and wasp males are not usually the primary pollinators for plants, but rather the females, which collect pollen and nectar to feed their young, are typically the more important pollinators. In Florida, the green orchid bee has been found to visit and pollinate a variety of plants. However, the orchids that it visits in its native range of Central America are not found in Florida, and thus the males and females must mate without the aid of the fragrance compounds. Despite these limitations, the green orchid bee has established itself in Florida. It is a solitary bee, and thus does not form large social colonies. It nests in aboveground cavities of many types, and uses plant resin to construct individual cells into which it deposits pollen and nectar and lays an egg. You can read more about the green orchid bee in this Featured Creatures. Assistant Professor of Entomology at University of Florida, pollination ecologist, bee biologist.